In this series, our experts address some of the most common and helpful questions that we receive from customers and community members alike. Trying to find the best HVAC system can be intimidating. With many different types and specifications, it’s important to do the best you can to educate yourself as to what’s out there. Start by getting a basic understanding of your options. Familiarize yourself with the basic types of HVAC systems available and the situations in which they work best. By having a basic understanding, you can then narrow down your best choices. When it’s time for you to make your decision, you’ll want to speak one-on-one with an expert, such as a Tuckey representative. They can help you choose the right option from among the best heating and cooling systems available. A trusted expert will also explain why certain options — such as larger, more expensive systems — may not be best for your situation. This guide will help you familiarize yourself with the best HVAC systems and get you well on your way to finding the most efficient and cost-effective way to heat and cool your home. It will also provide tips on ensuring you get the maximum energy efficiency out of the unit you choose. Fuel type is the most basic classification for HVAC systems, and it is the first thing you should look at when determining which system is right for you. Deciding the fuel options that are most practical for you will eliminate a number of options and help you focus your research. In certain situations, the choice will be easy. If only one or two fuel choices are available to you or are practical in your area, then focus your research on systems that use that fuel. 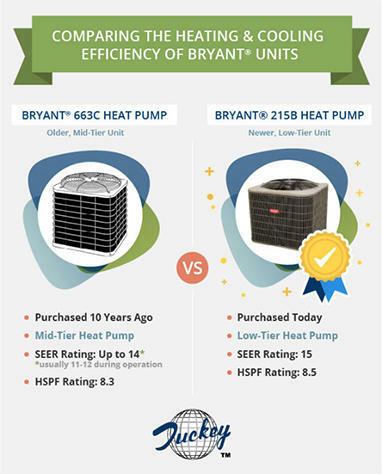 While fuel type is the first question to ask yourself when choosing from among the best heating and cooling systems, consider that a hybrid system may be the most efficient for your home or commercial building. According to current market conditions, natural gas is often the most inexpensive way to heat a home, but a separate electric air conditioner is required for cooling. Adding an electric heat pump can improve the efficiency of a system that primarily uses oil or LP gas. So while determining which fuel is right for you is the first question, it’s not necessarily the last. Combining sources or building a system with different main components is one way to achieve the kind of efficiency and long-term cost-effectiveness for which you’re looking. A heat pump is an electricity-based heating and cooling system. While other temperature systems convert fuel or electricity directly into heat, a heat pump works by moving heat from one place to another. In this sense, it functions similarly to an air conditioner. Heat pumps can be a very efficient way to heat and cool your home, but depending on where you live, it’s not economical only to use a heat pump. In south central PA, conditions are not optimal for using a heat pump on its own, but it can reduce your energy costs if it’s combined with a furnace or supplemental heater. Heat pumps work in two ways – they either source heat from the air or the ground. Ground source heat pumps are also called earth source, geothermal or geoexchange systems. Choosing the right size and source of heat pump will depend on the conditions in your area. A qualified expert, such as a Tuckey representative, can talk you through which sort of heat pump is appropriate for your building. It’s not enough for your system to generate heat or create cool air — it also has to deliver it to the rooms in your home where you need it. Anyone who has lived in an old house where the air conditioning system makes the basement freezing and seems to barely cool the top floor knows how challenging it can be to efficiently heat or cool the different zones in your home. Your HVAC delivery system will include ductwork and/or radiation. Forced air systems use ductwork to conduct air that’s been heated or cooled into the conditioned space. Radiation, on the other hand, heats the air in the conditioned space itself without having to conduct it anywhere. Baseboards, cast iron radiators, and radiant floors or ceilings all use this principle to heat the conditioned space. If radiation is the main method of heating in your home or commercial building, a separate duct system is necessary in order to add air conditioning. Inefficient ductwork can cause hot and cold spots in your home. Often a furnace or other HVAC equipment is the right size and solution for a home, but the reason it can’t properly heat or cool the space is because of inefficient ductwork. If one-third of the heating or cooling you are paying for does not reach the space it is designed to reach, it can make the overall system seem dysfunctional — and it’s often the ductwork that’s causing the main problem. Investing in high-quality ductwork installed by an expert professional can lead to major savings and increase the overall cost efficiency of your HVAC system. Having your ductwork properly tested, repaired or, in some cases, replaced, can be the single most effective change you make to your HVAC system. Repairs to ductwork can improve the efficiency of heat pumps, furnaces and any forced air system. It is also crucial that an expert, such as a Tuckey representative, installs any new ductwork. The expert can advise you on whether your current ductwork produces inefficiencies that lead to higher energy bills. The U.S. Department of Energy advises, “Duct repairs could be the most important energy improvement measure you can do,” so ensure a qualified professional installs and repairs your HVAC delivery system. The short answer for whether bigger is better when determining what type of HVAC equipment is best for you is “no.” The temptation is to look at inefficiencies in your current system and think if you had a more powerful furnace, a larger air conditioner or a bigger heat pump that your home would get the heating and cooling it needs. It turns out that it’s more about fit than size. Trying to get you to buy a larger system than you actually need is a well-known practice by less-than-respectable heating and air conditioning contractors. Not only will this cost you more to purchase and maintain, but it also may actually result in a system that provides less comfortable heating and cooling. Consumer Reports Magazine writes, “Beware of being sold an over-sized unit. An over-sized air conditioner will cycle on and off more frequently, causing noticeable temperature swings and putting more wear on the equipment.” While the first thought is often that hot or cold spots in the home will be solved by a larger — and more powerful — unit, it’s often the case that installing a larger unit will exacerbate problems of uneven heating and cooling. Larger units will turn on for only a few minutes, supposedly reaching the desirable temperature, and then turn off. These short, less frequent cycles are less efficient and produce more temperature fluctuations than more moderate cycling. The solution to uneven heating and cooling is often to perform maintenance on or replace existing ductwork, the source of many such problems. A service provider, such as Tuckey, with a reputation for reliability and expertise will recommend the appropriate-sized HVAC unit for your space and ensure the delivery system is working efficiently. Efficiency is a technical term that can be misleading. As a consumer, your natural instinct is to strive for the most efficient system, but there can be a difference between the most technically efficient system and the most cost-efficient. Another classic example is of electric heating versus natural gas. A chimney-vented natural-gas furnace may be only 80% efficient while electric baseboard heating is 100% efficient. Nevertheless, the natural gas system is considerably cheaper to run. Energy efficiency in the technical sense is important, but it must be understood as one component of an overall cost structure. Often the cost of fuel is more important in determining the best HVAC systems that will save you money. Sometimes consumers can get hung up on certain brand names. Perhaps a family member or neighbor has had a good experience with a system from Amana, Bryant, Trane or Lennox, and you naturally want the same experience. When it comes to HVAC installation and maintenance, and even determining the best HVAC system prices, brand loyalty can be misleading. Proper, expert installation and maintenance is a more important factor in how well your heating and cooling system performs than brand name. Expert representatives such as ours will have experience with all major HVAC brand names and be able to ensure you get a proper installation — without high energy costs or uneven service. The best installation experts do not promote one particular brand, but instead tailor solutions specifically to your situation, regardless of the brand of equipment used. Choosing your installation and maintenance expert is more important than choosing your equipment brand. Common installation mistakes can result in increased utility bills, a reduction in cooling or heating amounts, and more wear and tear than is necessary on your system. Once you’ve chosen the HVAC system that’s right for you and had it properly installed, you need to ensure it is properly maintained. Neglected systems will eventually become inefficient, with any number of problems resulting when the system isn’t regularly inspected and repaired. Subscribing to a regular preventive maintenance program, such as the maintenance plan Tuckey offers, will ensure a qualified professional performs annual or seasonal inspections on your equipment, noting any problems and what can be done about them. Minor problems can sometimes quickly turn into major ones. Spotting leaks or cracks early can mean the difference between a small, inexpensive repair and an extensive overhaul of your system. As with buying and installing the system, spending some money on preventive maintenance now can save you money down the road. Your maintenance professional will look for ways to keep your system running efficiently and ensure your system doesn’t suffer from a significant breakdown. Once you’ve chosen the HVAC system that’s right for you, preventive maintenance is the only way to ensure your system continues to run smoothly. HVAC system prices are, unfortunately, impossible to speak about generally. The type of fuel required, the local weather conditions, and the size of the space you need to heat or cool are only the most obvious factors that need to be determined before a proper estimation can be made. It’s also essential to consider not just the upfront costs of equipment and installation, but also the medium- and long-term energy costs of heating and cooling your space. At times an inexpensive installation will do. In other cases, a small investment during the initial installation will help save future costs over the long run. Only by speaking to a qualified professional can you begin to estimate how much the HVAC system that’s right for you will cost. Contact us to speak to a Tuckey representative who will help you find the right system at the right price for your space. 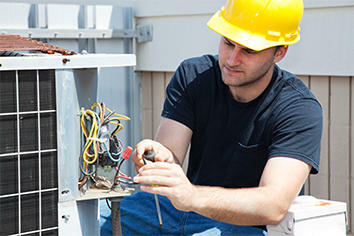 Choosing the right HVAC system for your home or commercial space doesn’t have to be intimidating. With some basic research and the help of qualified professionals, you can gather all the information you need to make an informed decision. At Tuckey, we are committed to providing the best service and advice in South Central PA. Look to us to help you not just figure out what you need, but also what you don’t need and what may cause problems for you down the road. We not only provide recommendations and estimates, but the information and guidance you need to make an independent, informed decision. Contact one of our customer care representatives online or call 717-534-1136 to get started with a free home survey and system proposal based on your specific needs.